This novella begins right where The Goddess Test leaves off (and consequently will contain spoilers if you haven't read The Goddess Test yet). You have been warned. Kate has passed her test, married Henry (Hades), and earned her immortality. Before she can begin her new life as Queen of the Undead she must spend six months topside living among mortals. Henry cannot accompany her so she travels with James (Hermes) to see Greece. En route they run into the twins, Castor and Pollux, who are on the run from both Walter (Zeus) and Henry. Naturally, Kate has to intervene and figure out a way to help the twins and not anger Henry or Walter. 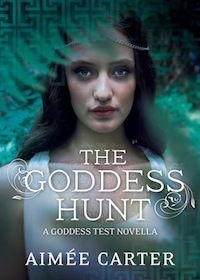 This book is not essential to the trilogy, but it is a nice segue from the first book, The Goddess Test, to the second, Goddess Interrupted (review available March 5, 2013). It's told in alternating points of view, Kate's and Henry's, and helps us to understand some of the motivations of their actions in later books. It's a quick read and worth it.